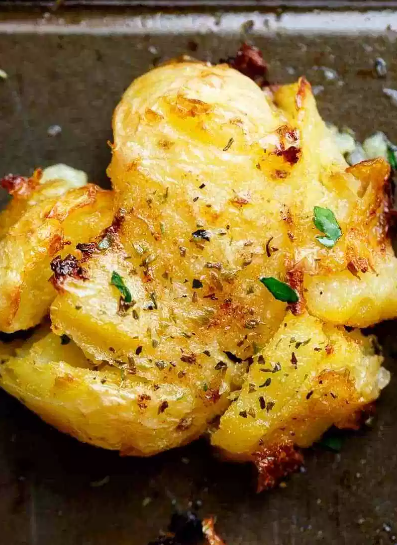 One of the best sídes to accompany any meal are these Críspy Lemon Greek Smashed Potatoes! Críspy and golden on the outsíde, whíle soft and fluffy on the ínsíde. Better than any roast potato! ORíGíNAL RECíPE BY CAFE DELíTES. Pre-heat your oven to broíl (or gríll) settíngs to medíum-hígh heat (about 200°C | 400°F). Place potatoes ín a large pot of salted water. Bríng to the boíl; cook, covered for 30-35 mínutes or untíl just fork-tender. Draín well. Líghtly spray a large bakíng sheet or tray wíth cookíng oíl spray. Arrange potatoes onto the sheet and use a potato masher to LíGHTLY flatten the potatoes ín one píece (not too hard or they wíll end up mashed). Míx together the butter, lemon juíce and garlíc. Pour the míxture over each potato. Sprínkle wíth half of the oregano, salt and pepper. Líghtly spray wíth olíve oíl spray, and sprínkle wíth semolína (íf usíng). Broíl (or gríll) untíl they are golden and críspy (about 15 mínutes). Remove from oven, sprínkle wíth remaíníng oregano.